Yesterday, I received a message from Pastor Vaidas Klesevicius of the Vištytis (German Wischtitten) Evangelical Lutheran Church regarding a desperate situation. The church building, which was built in 1844 (the parish was established in 1842) is in dire need of a new roof. 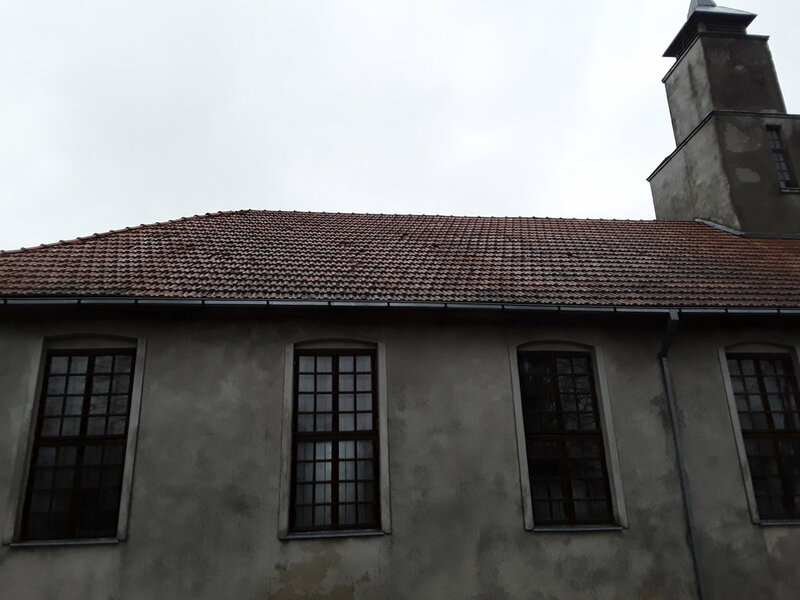 Someone has generously donate the new clay tiles needed for the job, but the Vaidas and the congregation still need to raise nearly 19,600EUR for the labour to install it. The faulty roof is causing serious water damage on the interrior of the church and will only continue to get worse without repair. What makes the issue more challanging is that the building is considered a Cultural Heritage Site, which increases the cost of labour and complicates the process. Below I have included Pastor Vaidas' original email to myself and several other researchers and individuals whose families were associated with the congregation. Please remember that English is not Vaidas' first language. If you wish to donate any amount of money, please reach out to Pastor Vaidas directly (his email is listed below.) I have also suggested that he set up a PayPal account to make donating (especially for Americans) easier as opposed to wiring the money via an American bank. Please contact him for more information. I'll admit that while I myself am not a religious person, I know that this parish was extremely important to my ancestors, and was the center of many parts of their lives--from their religious expression, to marriages, baptisms, education, spiritual and mental support, and socializing with their community in general. It would be a tragic thing to see it disappear to time. If you can help, please do. This email I send as Vistytis pastor Vaidas Klesevicius to those whom I know with asking to send it even further to those who could be interested in helping us – Vistytis lutheran church. We are very small congregation, so we can’t to do such big work alone and we look for help. With this email I would like to ask everyone for the help for any donation to Vistytis Lutheran church that needs firstly immediately that the church roof could be replaced to the new one. To this email I attach some photos of today situation that to see our situation and big our needs. We already got new tiles for the roof that were donated, but now have no money for the works to change the roof. Because Vistytis church is cultural heritage monument there are some specific rules. There is a need of project for those works that need to be approved by Department of cultural heritage and those works are aloud to be done only by the certified firm. Such firm made some calculation in which they calculating: changing the roof( taking off an old one and putting new tiles), some repair works of bell tower and some repair works inside the church (church ceiling who are now already damaged by water) and lightning protection, so all in all calculation looks like this that we need 29 771,28 euro. But most of all now what we need firstly it is to find at least money for changing the roof and it is 19577,76 euro if not to put snow barrier. If You have any ideas who could help us, please share it with us. Maybe You are a member of the parish in which you could share about our situation and maybe that parish would like to help us and to have sister parish in Lithuania. All thoughts, all ideas who could help us in our situation we agree to discuss and find the best way how we could all together save Vistytis church. for example DEUTSCHE BANK and they swift DEUT DE FF.